Fresh ingredients are important for brewing great beer, but if you buy brewing ingredients in bulk you can also save money. So this week we take a look at how to store and preserve your hops, grains, yeast and malt extract for brewing great beer. When I first started brewing I bought one kit at a time and brewed it. However once I started brewing more and eventually made the shift to all grain brewing I quickly figured out that buying in bulk saves money. A 50 lb (23 kg) bag of malt can sometimes be found for half the price of buying it a pound at a time, and a pound of hops is much cheaper than hops by the ounce. Since fresh ingredients make the best beer, the challenge for the brewer is how to best preserve your ingredients until you can use them. The four enemies of beer ingredients are heat, light, moisture and oxygen. Minimizing exposure to all of these is critical to brewing great beer. Dry malt extract should be stored in a dark, cool area, ideally in an oxygen barrier bag. A lot of dry malt extract comes in oxygen permeable plastic bags, so if you plan to store it for an extended period you should move it to a foil barrier bag or oxygen proof container. Heat and light are also bad for malt extract as they will both darken and break down the extract, so store it in a cool dark location. Refrigeration is not a bad idea if the malt is properly sealed as it will preserve it longer. Liquid malt extract in cans is primarily at risk from heat, so keep it in a cool location or refrigerate it. Properly stored it can be used for a year or more. Open syrup or syrup sold in plastic containers has a much shorter shelf life as it is at risk from both infection and oxygen. I recommend refrigerating this malt and using it within 3 months if possible. If you can carefully repackage it into an oxygen barrier container like a glass jar it may last a bit longer. Again you want to minimize exposure to light and heat as well. Uncrushed grains are relatively stable and can be stored for a year or more if kept cool, free of moisture, away from light and free of bugs. Grain bags, plastic bags or bins are fine for storage and a temperature between 50-70F is appropriate for storing. Again the enemies are too much heat, too much light, bugs and moisture. Some people refrigerate their grains to help them last a bit longer, but its not really necessary for uncrushed grains. Crushed grains do not store as well largely due to exposure of the interior of the grains to oxygen. I generally try to use crushed grains within a few weeks, but some sources say they can last as long as 2-3 months if properly stored. Again you want to avoid heat, moisture and light when storing them. An oxygen barrier container, such as a glass jar may help a bit and refrigeration can slow down the spoilage as well. 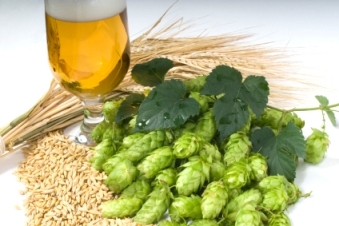 Hops are even more susceptible than grains to heat, oxygen, light and moisture. They are best stored in a freezer in an oxygen barrier bag such as a foil bag or glass jar. As they age they will lose bittering power as well as aromatic oils, eventually imparting a distinctive stale flavor. The rate at which hops age depends on both the type of hops, their Hop Stability Index, and their storage conditions. Some varieties will last only a few months while others can be kept for nearly a year if properly stored. Dry yeast is easy to store and has a long shelf life. If kept sealed in its pouch at room temperature, it can easily last 1-2 years. You can also refrigerate it, but don’t freeze it, to extend its life even further. Liquid yeast, in contrast, has a relatively short shelf life. Liquid vials and pouches lose about 20% of their viability each month, which means that their effective shelf life is only 4-6 months in most cases. Also they must be stored refrigerated (not frozen), or they will decay even faster. A starter can help revive an older yeast packet, but in general I don’t brew with packages older than 6 months old. I will mention that if you have a package of yeast that is nearing the end of its useful life you can make a starter and then wash the yeast so you can store it for a longer period. Be sure to use a good strong starter again to get the yeast going strongly a day or two before you brew with it. I hope you enjoyed the above tips on preserving your ingredients. Remember that in general heat, light, moisture and oxygen are not good for storing beer ingredients.